Too often, history is reduced to names and dates in textbooks, or long-winded lectures by teachers, but in Painting Czeslawa Kwoka, Honoring Children of the Holocaust, painter Lori Schreiner and poet Theresa Senato Edwards give color, life, and stories to children that were victims of the Holocaust. Their collaborative collection is gut-wrenching, and more so than any war movie or History Channel show, it serves as a stark reminder of the atrocities committed during World War II. It is history written from the victim’s point of view. According to the introduction written by Schreiner, the idea for the collection occurred when she read an article in the New York Daily News about Wilhelm Brasse, a Polish political prisoner who survived Auschwitz and was assigned to take pictures of concentration camp prisoners, including biracial children, Jehovah Witnesses, Catholics, Gypsies, Jews, and other groups. The article included a strip of Brasse’s photographs that were of Czeslawa Kwoka, a 14-year-old Polish Catholic girl. Schreiner was inspired to do a series of paintings based on the photos, and eventually she found more photos through the United States Holocaust Memorial Museum and the State Museum Auschwitz-Birkenau in Poland. Throughout the collection, the photos are copied on one page, with Schreiner’s artwork on the next page, creating a chilling juxtaposition. The photos are all black and white, but Schreiner’s color, textures, and layers reanimate the depictions of the children. Below each photo, the artist and writer included a blurb about each child, allowing the dead to come to life even more. Edwards’ poems are just as impressive and moving as the artwork. The poet works in varied forms, including lyric poetry and the prose poem. The voice and conversation shifts from poem to poem. Some of the work is a dialogue between the painter and the poet, while other poems describe what is seen in the painting or photo. Edwards also adopts the voice of the children, including in “I will die at night,” which is about Deliana Rademakers, a Jehovah Witness who died at Auschwitz in 1942. Edwards writes, “no. I will try to speak/my voice cold as roots/I try to speak in camp/soldiers tug at stripes-what does that mean to me?” She writes a few lines later, “I want to speak but will have no mouth, night catches voice, holds it till/morning.” Edwards successfully gave Deliana a voice through the poem and allowed her to speak years after her horrific fate. Several of Edwards’ metaphors are just as well-crafted as Schriener’s portraits, and several of them are based in nature imagery. In “Zigmond Alder,” she compares the child’s eyes to “muted moons.” In another poem, “Because of Paint,” she compare’s a girl’s face to “a stagnant pond,” “yellow-green with algae.” These images are just as vibrant as the array of color in the paintings. 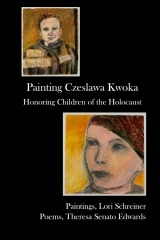 Painting Czeslawa Kwoka, Honoring Children of the Holocaust is a book that should be taught in history, literature, and creative writing classes. It is a compelling collaborative effort that brings to life through photos, paintings, and poetry the stories of the children of the Holocaust. Those that never had a voice, that had no control over their gruesome fate, are finally given the chance to speak. Brian Fanelli’s poems have appeared in Red Rock Review, Harpur Palate, Third Wednesday, Boston Literary Magazine, The Portland Review, Rockhurst Review, and elsewhere. He is the author of the chapbook Front Man (Big Table Publishing), and his first full-length collection is forthcoming through Unbound Content. Find him online at www.brianfanelli.com.